This primaERP TIME TRACKING feature allows you to connect with the MS Exchange version 2010 and above or with Office 365 online. 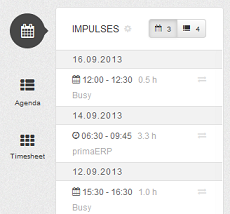 This way you can keep track time of your daily activities as planned in their calendars. Exchange is a mail-based server for businesses. Usually it’s used via MS Outlook or OWA (Outlook Web Access) versions to connect with MS Exchange and exploit all of its advantages. If you are not sure whether you have an account, we recommend you to contact the IT support or the network administrator of your organization. The synchronization with primaERP is carried out based on the email client application in use: MS Outlook or OWA. 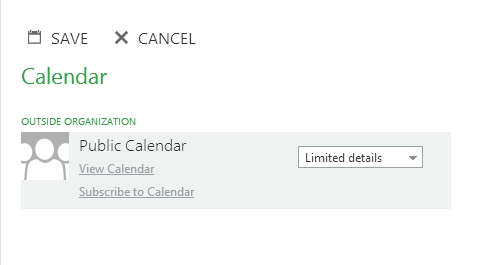 Click on the MS Outlook Calendar. 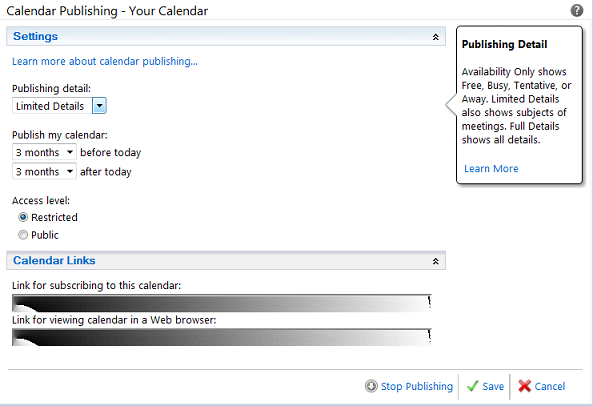 If you have multiple calendars, right click on the calendar to publish. Select: Share> "PUBLISH THIS CALENDAR". In the Publishing details field, make sure to select the option "Limited Details" to avoid future issues. 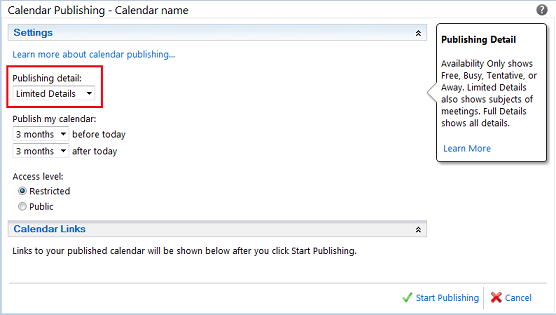 Next, you will see two Calendar links; copy the first one - link for subscribing - which will be used in the second step. Click on "Settings", which is located at the top right side of the screen. Select "TIME TRACKING settings" on the sub-menu. 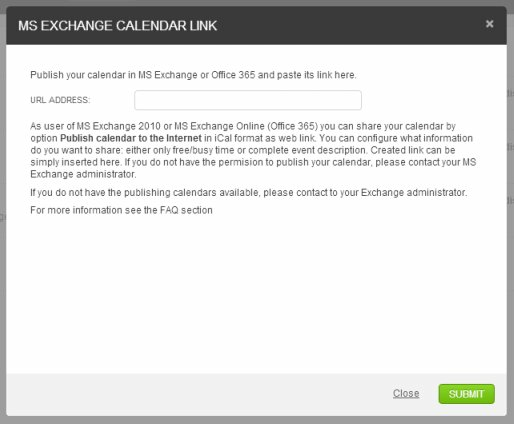 In the MS Exchange Calendar section, press "SHOW"
In the MS Exchange Calendar section, click on "EDIT"
Paste the link you got in the previous step and click the "SUBMIT" button. Please ensure that the URL starts with https://. If you have multiple calendars, right click on the calendar to unpublish. 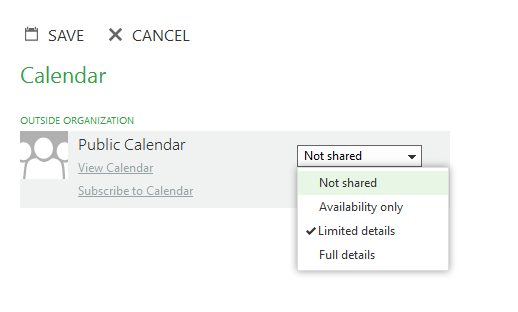 Select: Share> "CONFIGURE THIS PUBLISHED CALENDAR". Access to your OWA account. Note that this action may not be available on your account. If not, you will have to request access from your IT administrator. Log in to your OWA account and go to your Calendar. 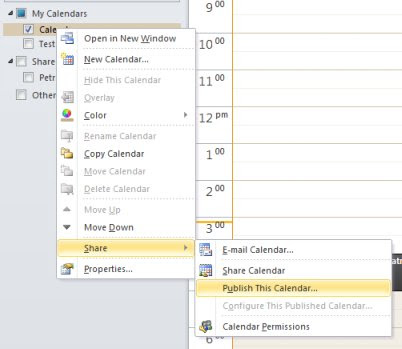 Right-click the calendar you want to share. Or, if you’re using a touch device, touch and hold the calendar name. In the Outside organization section, look for Public calendar. Make sure to select as the level of access "Limited Details". Right-click on the link "Suscribe to Calendar". You can stop publishing your calendar at any time. 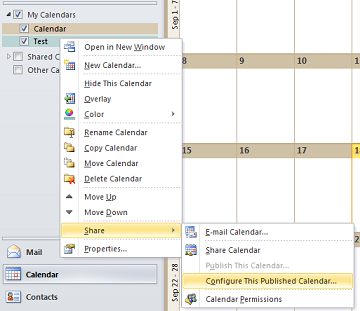 In MS Exchange Calendar section, click on "EDIT"
Right-click the calendar you want to stop sharing. Or, if you’re using a touch device, touch and hold the calendar name. In the Outside organization section, set the level of access to "Not shared". Once the MS Exchange Calendar is synchronized with primaERP, some users may expect the following issue. 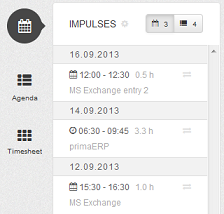 Sometimes after connecting the MS Exchange calendar, some users will see in the Impulses panel only the following types of entries: Busy, tentative and free. This is due to the incorrect settings selected during the calendar publishing process. In the Publishing details field, make sure to select the option "Limited Details" to resolve this issue. In the Outside organization section, set the level of access to "Limited Details" to resolve this issue.